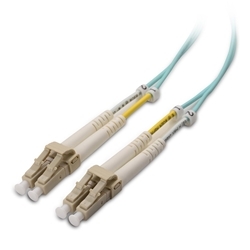 These fiber cords are OM3 rated for the extreme demands of SAN networks. The OFNP (plenum) rating conforms to strict NEC building safety codes but is compatible with unrated or OFNR (riser) rated applications. They are precision factory tested for insertion and return loss to ensure transmission performance per TIA-568-C.3 specifications. The combination of LC connectors in a protective yoke, strain relief boots and zirconia ceramic ferrules provides a dependable, low-loss performance. The Cable Matters Multimode Duplex 50/125 micron fiber patch cords offer a time saving alternative to terminating and testing cables on site in residential, commercial, educational, or industrial locations. The LC push and latch connectors are the latest standard for small form factor equipment and patch panels for bi-directional data transmission. Includes a lifetime warranty and product support.